» How Did Miami Adjust to Indiana’s Defense? How Did Miami Adjust to Indiana’s Defense? 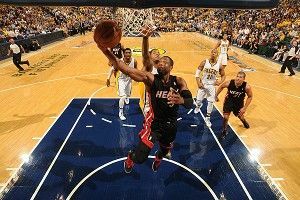 The Miami Heat struggled offensively in the first three games of their series against the Indiana Pacers. Even in Game 1, which they won, they failed to to crack 100 points, and in the two losses they scored just 75 points. Game 4 was a must-win for them, and they knew they had to make adjustments — specifically more movement without the ball from Dwyane Wade and LeBron James. Through Games 13, the Heat had just 17 possessions labeled as “cuts” (according to Synergy Sports), from which they scored just 10 points. In Game 4, though, they ran 12 cut plays for 20 points. The main difference is that in the first three games, Miami’s bigs were cutting, but in Game 4, Wade and James scored 14 of the 20 points that came off of these plays. This new game plan was on full display at the end of the first half as the Heat were looking for a quick two-for-one. James picks up the basketball around half court. Shane Battier clears out of the strong side so Wade and James can play a two-man game. The Heat know how Indiana will guard this: They’ll overplay the passing lane for Wade. So Wade responds by faking with a step toward the basketball followed by a backdoor cut. LeBron finds him and Wade dunks. In both sets above, James begins on the weak side and comes off of a backscreen, with the goal of getting his defender on his back at the front of the rim. The Heat get exactly what they want, and James is able to use his size and position to finish easily. While some of these cuts were a result of set plays, there were also a few instances where players were allowed to react to the situation, which was also part of Spoelstra’s adjustment. The Heat must have watched tapes of the first three games, in which they failed to capitalize on the Pacers’ poor defensive spacing. In Game 4, they took advantage. The Heat ball handlers deserve some credit for the improvement as well. They made James and Wade’s cutting plays successful by repeatedly finding them by the basket. Not only did this newly implemented strategy result in more shot attempts at the rim, but it forced Wade and James to remain aggressive without having to rely on isolations or dribble-drive penetration. Now it’s up to Indiana to adjust. What's the Matter With Fernando Torres?